Welcome to the web resource for the Mariner's Guide to Nautical Information by Priscilla Travis, published by Cornell Maritime Press, a division of Schiffer Books, Atglen, PA (www.schifferbooks.com). This website was created by me, the author, and I control and maintain it as a personal website. Although the website is a companion to the book, there's a good deal of new information that is of interest to boaters who don't have the book. Look under Updates, New Links, New Publications and Blog. Purchasing Information and Reviews are under the Home tab, new entries and additions to existing entries are found under Updates; the New Links and New Publications tabs add information not included in the book; under New Publications is the Articles tab. The Blog has a diverse ongoing posting of nautical topics; and the More tab has Corrections, Contact information, and About the Author. The intent of the website is to allow the book to grow outside the pages, with boaters finding and sharing resources to help them enjoy their time on the water. I also created a facebook page for the Mariner's Guide, which has more flexibility for sharing and communicating. http://www.facebook.com/pages/Mariners-Guide-to-Nautical-Information/261620677258117. If you already bought a copy of the book, I thank you! Please check this website regularly for new information. If you'd like to know more about this reference for all boaters, please read on. Faster than an Internet search, the alphabetically-arranged Mariner’s Guide to Nautical Information puts over 2,000 modern nautical topics and terms at your fingertips, with enough practical advice to be useful. If you’re thinking about getting started on the water this book is for you, and if you’re already out there and dreaming about distant horizons there’s a wealth of information to help you become more competent, confident, and comfortable afloat. There’s an international emphasis to include boaters in Canada and across the pond. Everything from the Navigation Rules, cruising under sail and power, electronics, communication, safety, weather, technical topics, and spoken nautical language makes this book a comprehensive resource. The Topic Index helps you test your knowledge and learn about a subject, and the extensive annotated bibliography identifies hundreds of relevant publications and Internet resources. Illustrated with 186 photographs and line drawings. This modern nautical reference is intended for the complete novice and for those who are already enjoying time afloat. There are no presumptions about the reader’s familiarity with nautical matters. If you don’t know the pointy end from the square end or what an anchor is, the really basic things are in here. Boaters with some experience will find new things to learn and discover new aspects of the familiar. The book is arranged alphabetically to give easy access to words and topics. Cruising is somewhat emphasized, because that’s been my experience, but there's plenty of information to enhance your knowledge and skills, no matter how you enjoy your time on the water. Cruising isn’t defined by the type of boat, its size or where you go. You can have a great cruise around a lake, explore a bay, venture along the coast or go offshore under sail and power. It’s an activity for all who take pleasure afloat. Why learn the nautical lingo? You can say “pull that rope” or “tie it to that metal thing on the dock” or “turn to the right.” Using the correct language and having a general understanding of concepts is important because in many circumstances quick, accurate communication is essential. There may not be time to explain in detail. Nautical language can be very precise or annoyingly imprecise. That’s what makes it interesting to learn. Whether you’re just starting out in boating activities, going on day trips, enjoying weekends afloat, contemplating extended cruising or planning to cross an ocean there are many things in here that will help you become more competent, confident, and comfortable afloat. Fair winds and smooth seas deliver boundless pleasure, but when things get blustery and bumpy, you’ll be glad you read the book and have it on your shelf. bobstay – a metal rod, wire or chain extending from underneath the front of a BOWSPRIT down to the STEM near the waterline. The bobstay counteracts the tension of the HEADSTAY on the top of the bowsprit, but it’s not used on all bowsprits. For other photos see BOWSPRIT, CATBOAT, and JIB, YANKEE. bollard – a strong vertical post or two attached posts, made of metal, strong wood, or sometimes concrete found on a pier or a wharf, used for mooring lines. Also used on towing vessels for towlines and WARPS (may be called a towing BITT). bolt cutters – bolt cutters are for use on MILD STEEL (such as non-hardened steel bolts and chain). They are ineffective for cutting STAINLESS STEEL RIGGING and hardened chain. A RIGGING CUTTER is needed with these metals. bolt rope – a rope or thinner line sewn along the LUFF (also called a luff rope) and/or FOOT of a sail to strengthen the edge or to feed it into a groove on a SPAR. bonding, bonding system – bonding is connecting all metal, non-current carrying parts of a vessel, such as the engine, propeller shaft and propeller, SEACOCKS, metal equipment housings, and any metals that come into contact with seawater (either externally or in bilge water) to a common ground point (the SHIP’S GROUND). The purpose of a bonding system is to protect underwater metals from STRAY CURRENT CORROSION, to ground the electrical system, and to provide lightning-strike protection. The connections at all bonded items should be kept tight and free of corrosion for the system to be effective. Bonding is a complex subject discussed in technical literature, but it’s an important topic to understand. engine maintenance log – a written record of all the work done on the engine, whether by you or someone else. The log should include the dates, the engine hours, the tasks performed, the parts and supplies used (if any), and notes about the process, including any modifications or repairs. This log is important for making sure the required maintenance is done, and for diagnosing problems in the future. A buyer may request this log when you sell the boat. engine manuals – the engine should have several manuals, some of which may be aboard, and some of which can be purchased or downloaded from the manufacturer’s website. The operator’s manual is the most basic: it explains the operation of the engine, describes the controls and gauges, outlines the maintenance schedule, and gives the engine specifications. A shop manual gives detailed, technical instructions for repairing the engine and replacing parts. It’s designed for use by a skilled mechanic. Even if you aren’t in this category, if you venture away from home waters have this manual aboard for a professional to use. A comprehensive parts manual is essential for ordering parts and for locating where things are on the engine. It’s very useful for the exploded diagrams that show how the parts fit together. After taking something apart, it’s good to know how to put it back together correctly, with no parts left over. Some engines have an installation manual, which is useful for checking for installation problems, and if the engine has to be pulled for repair. engine, raw water cooled – an engine that is cooled entirely by sea or lake water running through it. See COOLING SYSTEM, ENGINE and ENGINE, FRESH WATER COOLED. schooner – a sailing vessel that has two MASTS of equal or almost equal height. 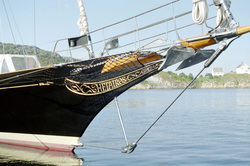 The foremast is usually shorter than the the main mast (the AFT mast). For another photo see YARDARM. scope – the ratio of the length of the anchor RODE to the depth of the water. For example, in calm conditions (winds under 10kn) and a protected anchorage, a ratio of 5:1 is commonly selected as a minimum scope for anchoring with a rope rode. If the boat has a heavy anchor and an all-chain rode 3:1 is sometimes used in calm conditions. In tidal areas check the tide range and the state of the tide when first anchoring, so there will be enough scope for high water. Also include the height of the BOW from the water in the calculation: if the water is 20ft/6m deep and the bow is 6ft/2m above the water, the calculation should be based on 26ft/8m, which means 130ft/40m of rode at 5:1. Mark anchor chain and line to determine the proper scope; don’t guess. Use more scope (for example, 7:1 or more for rope and 5:1 or more for chain) if it’s windy, if the holding ground is poor or the anchorage is exposed. If there’s not enough scope the anchor can drag or pull out because the rode pulls on the anchor from too high an angle, thus lifting it out of the bottom. A SENTINEL can be used on the rode to increase the CATENARY, helping to keep the pull low on the anchor. If the amount of swinging room in an anchorage is limited, this may suggest the need to use short scope (less than the minimum or ideal), but this isn’t a good idea for safety reasons. See also ANCHOR SETTING. yaw, yawing – side-to-side movement of the vessel at the BOW and/or STERN, created by QUARTERING or following seas or combinations of wave systems. “Those waves were so jumbled we were yawing all over the place.” In rough, confused seas a yacht may also PITCH and ROLL, along with yawing, challenging the helmsman, the AUTOPILOT, or the SELF-STEERING to hold a course, and the crew to avoid seasickness. 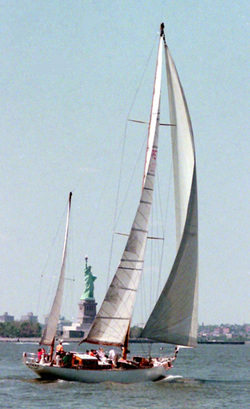 yawl – a yacht with two masts, with the AFT mast (the MIZZEN mast) shorter than the MAIN MAST. The mizzen mast on a yawl is located ABAFT the RUDDER POST. A KETCH has a mizzen, but it is forward of the rudder post. It’s not always easy to tell where the rudder post is when looking at a boat; the definition reflects a technical distinction. zarpe – outward CLEARANCE papers issued by authorities in Spanish-speaking countries. When visiting some countries the authorities may request the zarpe from your last port. zero – the numeral “0” is spoken as “zero,” on the radio and when speaking a compass direction. All images on the website are taken from the book, except where noted at the bottom of the page. All images are copyrighted.